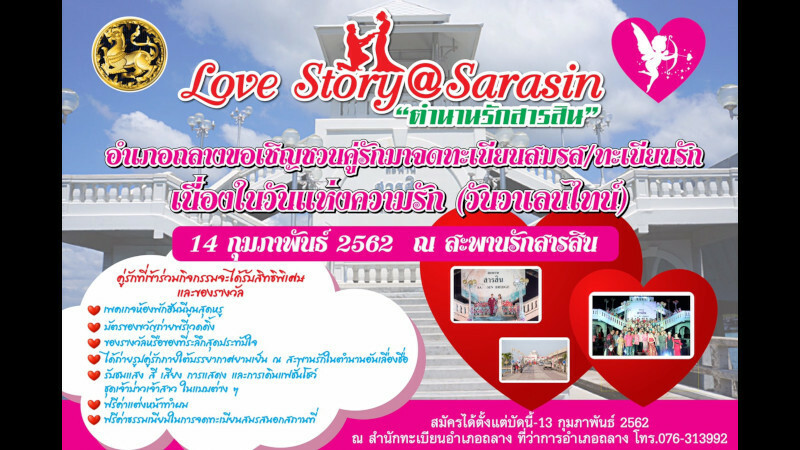 PHUKET: People from all walks of life are invited to be married or receive an “Afficrmation of Love” certificate at the “Love Story @ Sarasin” being held at the Sarasin Bridge on Valentine’s Day, this coming Thursday (Feb 14). 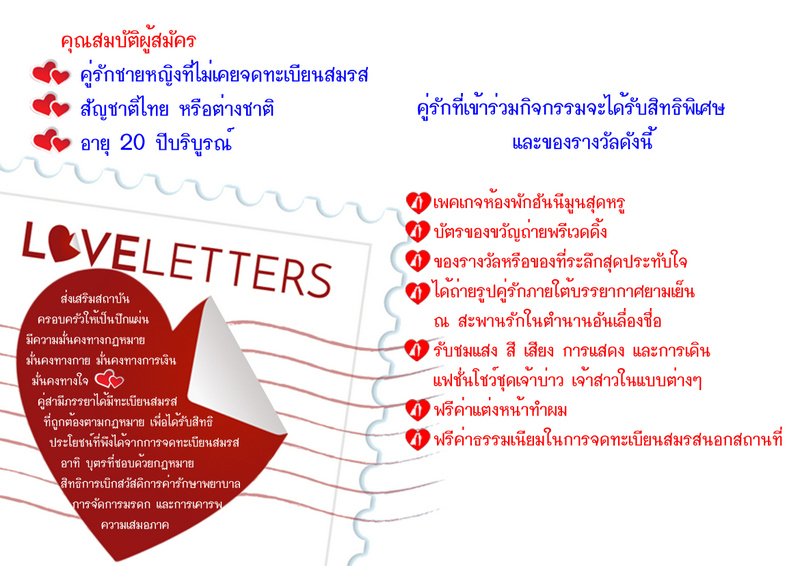 The invitation for people wanting to register their marriage is open to Thais only, and free, but the invitation to receive certificates as an “Affirmation of Love” is open to everyone. Couples taking part in the event will receive many gifts of special privileges and rewards, including luxury honeymoon packages. “We hope this event will promote Phuket tourism and local people and tourists will learn the history of the Sarasin Bridge,” said Thalang District Chief Adul Chutong. The Sarasin Bridge is renowned throughout Thailand for its sad tale of two star-crossed lovers choosing to end their lives by leaping into the fast-flowing waters below instead of facing life without each other. “We are looking for 14 couples to be married at the event,” Mr Adul said. Arrangements have been so that the brides and grooms can receive their marriage certificates on the day, he added. “And we hope many more couples will come to show their love for each other and promise to take care of each other forever,” he said. The invitation for people wanting to register their marriage is open to Thais only, and free, but the invitation to receive certificates as an “Affirmation of Love” is open to everyone, Mr Adul noted. “Everyone, every gender, every age and every nationality can apply for a ‘Love Certificate’,” he said. “We will have free makeup and hairdressing services. All couples have to do is come in their wedding dress and suits,” said Thalang District Deputy Chief Sukanda Huangrattanakorn. "We intend to give gifts and to all couples. However, if the prizes from the sponsors are not enough, we will make sure everyone gets something,” she added. The event, which Phuket Governor Phakaphong Tavipatana is scheduled to attend will also include a light-and-sound show, live performances and even a wedding fashion show highlighting modern, traditional Thai, Baba-Nyonya Peranakan style and traditional local Muslim style wedding costumes. 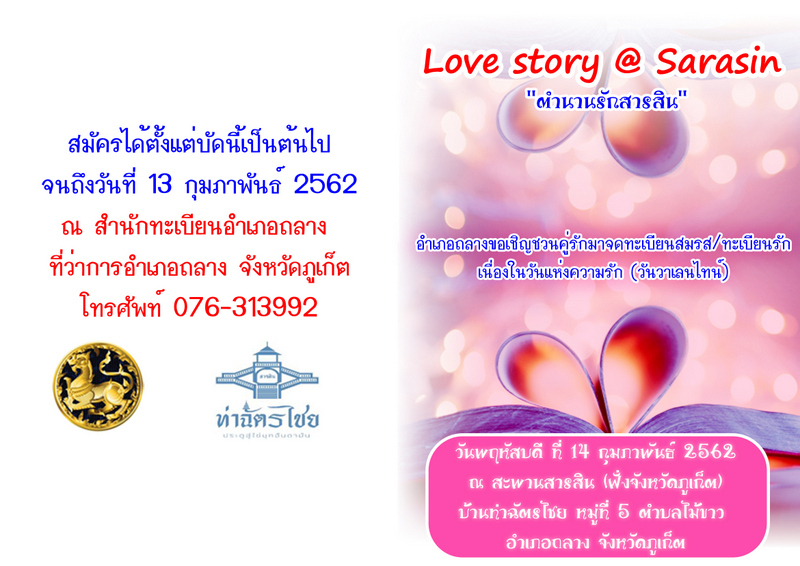 To join the event call the Thalang District Office on 076 313 992 before 4:30pm on Wednesday (Feb 13). Are they really doing it ? I wish everyone who participates a wonderful day.Special greetings to my best buddy R. and his lovely darling K..Hope you will really enjoy that day !